See detail tabs at the top of this page! Works better than any other enzyme product See the video below! See the detail tabs at the top of this page! DAILY DIGEST contains a full spectrum of the best essential protease digestive plant enzymes, at the highest protease activity, that break down complete and incomplete proteins including eggs, meat, fish, poultry, dairy and soy products. Protease enzymes also digest the cell walls of unwanted harmful organisms in the body. Protease breaks down waste including toxins, undigested protein and even debris from cells. Protease is not only found in plants it is also produced in the stomach, pancreas and small intestine. 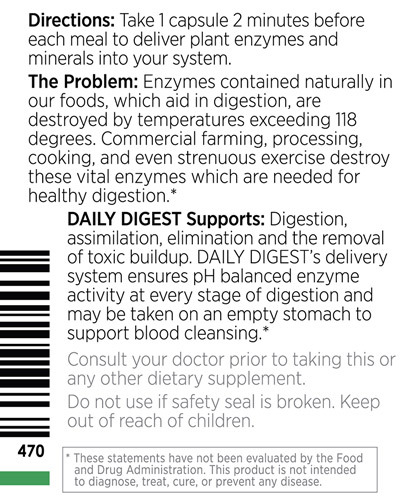 The protease enzymes in DAILY DIGEST support blood health, heart health, swelling, joints, wounds, burns, stomach lining, stomach health and digestion. Protease decreases with age. For these reasons, protease plant enzymes are in Essanté Organics DAILY DIGEST. 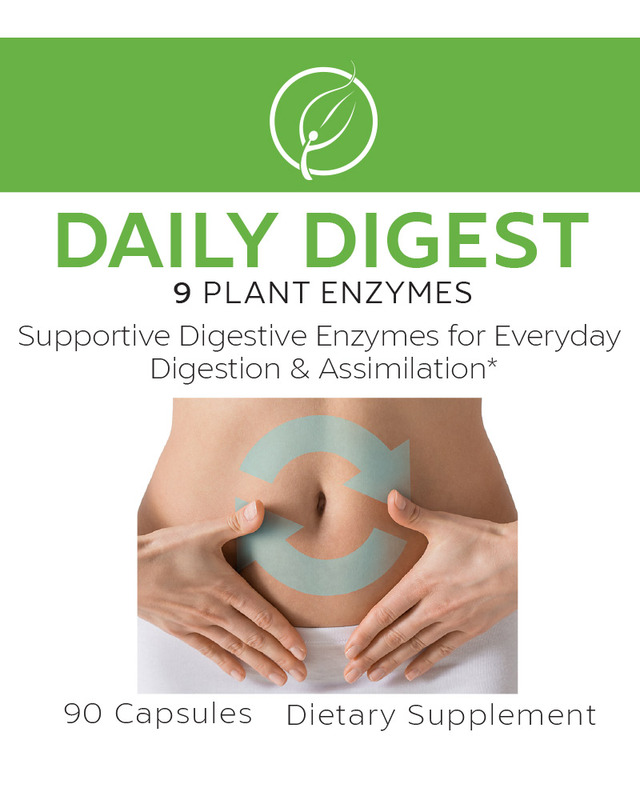 DAILY DIGEST contains a full spectrum of the best essential amylase digestive plant enzymes that break down carbohydrates including oatmeal, brown rice, potatoes and whole wheat bread into simple, usable fuel. Amylase is not only found in plants it is made in the pancreas and saliva glands of humans and many animals. Yet when we don't chew our food thoroughly amylase cannot be made in optimal levels. Thus, the amylase enzymes in DAILY DIGEST supports digestion, energy, blood sugar, cellular replication, immunity and the de-stressing of the body. For these reasons amylase plant enzymes are in Essanté Organics DAILY DIGEST. 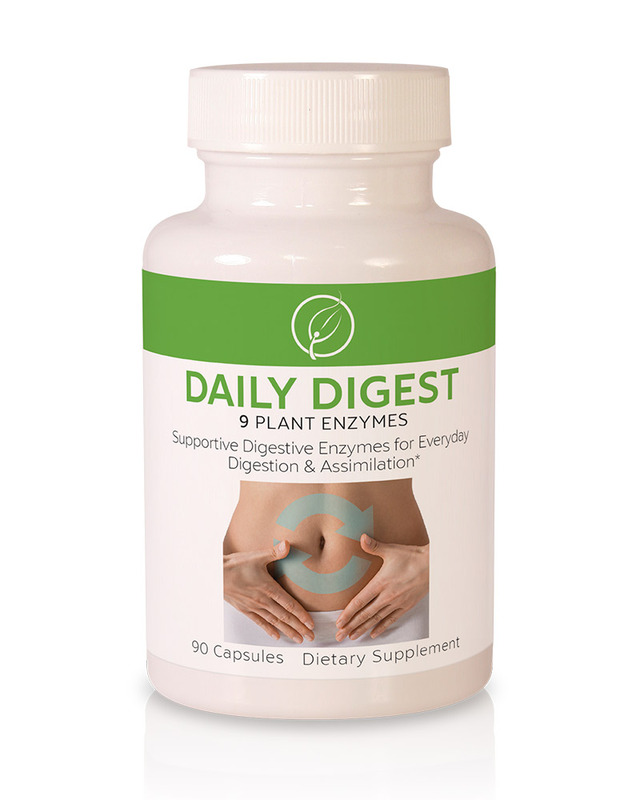 DAILY DIGEST contains a full spectrum of the best essential cellulase digestive plant enzymes which break down cellulose (a carbohydrate) to produce the body's number one source of energy. Cellulose is the major component inside the cell walls of the plants we eat. Humans do not manufacture the cellulase enzyme. Instead it is produced naturally by fungi, protozoa and bacteria. Thus we must get it from eating vegetation or from a dietary supplement, like DAILY DIGEST, to ensure we are breaking down the carbohydrates we eat. The cellulase plant enzymes in Essanté Organics DAILY DIGEST support energy, blood sugar, cholesterol, cell membranes, detoxication, the intestinal tract, protein absorption and immunity. The mineral nickel is required to activate your body’s liver enzymes. The mineral Molybdenum is required to activate your body’s oxidative enzymes. The mineral copper is required to activate the oxidase enzyme. The mineral iron is required to activate multiple enzymes throughout your body. For additional details on minerals, see the section below titled "What are minerals and are they necessary to activate digestive enzymes?" This digestive plant enzyme is requred to digest gluten. Gluten free DAILY DIGEST contains a full spectrum of the best essential gluten free malt diastase digestive plant enzymes which break down starches into usable energy that is necessary for humans to function and remain healthy. The malt is extracted using filtered water which is evaporated and converted into a thick, sweet, nutrient dense food (often used to sweeten cod-liver oil and bitter medications). Diastase is also in our saliva. When a person does not produce enough diastase in their saliva it can lead to acid build up and digestive issues. As we age, our diastase levels diminish. Gluten free malt diastase begins working after amylase finishes its job. Gluten free malt diastase supports the digestion of carbohydrates and keeps acid down after eating them. Raw honey naturally contains diastase, thus drinking honey supports keeping acid down. Malt diastase supports digestion, stomach acid levels, swelling, digestive discomfort, nutrient absorption, the pancreas and bowel movements. For these reasons malt diastase is in Essanté Organics gluten free DAILY DIGEST. This digestive enzyme is required to break down dairy foods. DAILY DIGEST contains a full spectrum of the best essential lactase digestive enzymes, derived from organic whole milk, that break down the milk sugar lactose. Most people are familiar with popular enzyme lactase because it gets the most press. Humans who are missing the enzyme lactase in their body often have discomfort when consuming dairy products, because their digestive tract is at a disadvantage. Their digestive tract cannot properly break down lactose because lactase is not present. Lactase is also produced by our body's cells and is typically located in our small intestine’s brush board, yet our lactase levels plummet shortly after we are weaned, by design. Yet many humans continue consuming dairy products, from other species, after they are weaned. Thus implementing a lactase supplement, like DAILY DIGEST, supports gas, bloating, swollen bowels and digestion, especially the digestion of dairy foods. For these reason, lactase is in Essanté Organics DAILY DIGEST. A full spectrum of the best essential digestive plant enzymes that breaks down protein. Bromelain is abundant in pineapples (especially the core), it is commonly used as a meat tenderizer. Bromelain supports digestion, the stomach, nutrient absorption, tear ducts, histamine levels, sinuses, joints, tendons, swelling, breathing, respiration, the lungs and airways, the autoimmune system, cellular division, the bowels, the colon, regularity, wounds, injuries and post-op surgery. For these reasons bromelain is in Essanté Organics DAILY DIGEST. A full spectrum of the best essential digestive plant enzymes that breaks down fats, including butter fat and triglycerides, into smaller fatty acids so your intestines can absorb them and send them into your blood and lymph vessels and eventually all parts of your body. Many of us consume more fat than we should, yet high triglyceride levels can raise your risk for heart disease. That is one reason why it is vital to have lipase working, and fighting to protect your body's health. Lipase is touted as the "prize fighter" digestive enzyme because it fights against major diseases according to Dr. Axe. A very small amount of lipase is also produced in your stomach, plus it is produced in the pancreas and small intestine, yet lipase levels decrease as we age and can be further reduced by drinking water (or any other beverage) while eating meals. Lipase can support nutrient absorption, weight loss, the gall bladder, cholesterol, the cardiovascular system, mucus levels, gas, bloating, the bowels, bowel discomfort, digestion, the epithelial cells located in most of our organs including the lungs, liver, kidneys, skin and reproductive system, pancreas and intestines. Lipase also supports swelling and the autoimmune system. 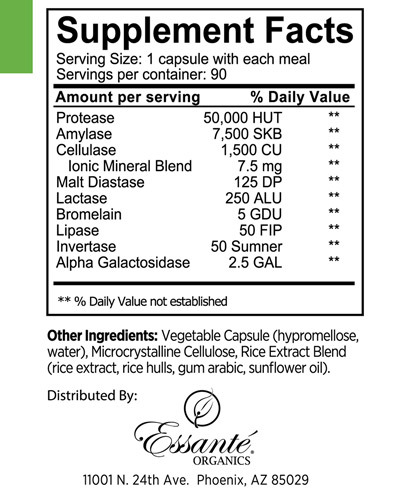 For these reasons, lipase is in Essanté Organics DAILY DIGEST. A full spectrum of the best essential digestive plant enzymes that break down carbohydrates, also known as beta-fructofuranosidase. Invertase enzymes are present in the tips of asparagus spears and they are also created naturally by bees, thus they are present in raw honey. Invertase enzymes are antioxidants that are naturally toxic to harmful organisms and they offer powerful protective and metabolic activities to humans. Invertase supports immunity, the intestines, the stomach lining, stomach acid and the digestive tract. Antioxidant rich invertase enzymes are also used by doctors to support the body after cancer treatments. For these reasons, invertase plant enzymes are in Essanté Organics DAILY DIGEST. 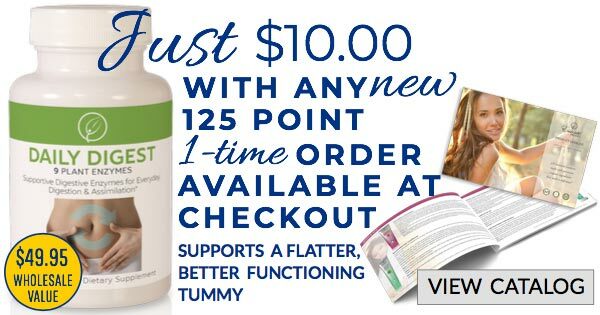 A full spectrum of the best essential digestive plant enzymes that break down complex starchy hard to digest foods filled with sugars, fats and gluten. Alpha galactosidase helps to digest nuts, beans, lentils, broccoli, wheat, corn, rice and more. Alpha galactosidase supports intolerance issues, digestion, intestinal gas, acid buildup, blood vessels, cardiovascular health and kidney health. For these reasons, alpha galactosidase is in Essanté Organics DAILY DIGEST supplement. Take 1 capsule 2 minutes BEFORE each meal or on an EMPTY stomach. Is DAILY DIGEST a certified organic product? All ingredients in DAILY DIGEST are 100% plant and mineral derived. All plant enzymes (listed above) are sourced and extracted from USDA NOP certified organic hydroponic plants raised in elevated, outdoor glass bio-domes, yet the enzymes (which are extracted from these plants) cannot be classified as organic. As of 2017 there are less than two dozen certified hydroponic operations and Essanté Organics is proud to be partnered with one of these special systems. Additionally, like enzymes, minerals cannot be classified as organic either, yet the minerals in Essanté Organics DAILY DIGEST are eco-friendly sourced in a remote region of Turkey, from pristine, mineral-rich, 100% toxic free earth discovered by a geologist and pastor who was featured on the Discovery Channel twice. His name is kept confidential for propriety reasons. Are enzymes necessary or are there enough of them in my digestive tract?  Enzyme production in the body decreases with age. As we age, our bodies produce less amylase, lipase and protease, making it harder for us to digest proteins, fats and carbohydrates compared to when we were younger. Doctors agree, digestive enzymes are often depleted in many of their adult patients. Per Dr. Axe, "It is a lesser known fact that a growing number of health problems can be linked to nutrient malabsorption due to a lack of digestive enzymes". Enzymes are necessary and vital to digestion and overall human health, yet enzymes are not activated, and cannot support the body, unless minerals are present. Due to our earth’s depleted and pesticide laden soils mineral deficiency is at an all time high in humans. Thus humans often have depleted minerals and in turn depleted digestive enzymes. Additionally, most humans drink water or other beverages while eating a meal, which is not recommended, because fluids are proven to interfere with and even deplete your digestive enzymes, which are necessary to digest your food. Per Dr. Axe, "Without proper levels of amylase and other digestive enzymes, it really is impossible to have your health be at its best." Are there enough enzymes in the food I eat? It depends on the quantity and spectrum of fruits and vegetables you eat and if you cook them or not. Many enzymes contained naturally in raw uncooked food, which are vital to digestion and nutrient absorption, can be destroyed by temperatures exceeding 118 degrees. Commercial farming, processing, cooking and even strenuous exercise can destroy the vital enzymes which are essential to digestion, nutrient absorption and overall healthy immunity. Why does the USA have a cold and flu season? Our nutrition team shares the cold and flu season exists 3 months out of every year (November, December and January) primarily because Americans consume their highest calorie meals (holiday meals) during these 3 months. High calorie holiday meal consumption, coupled with digestive enzyme deficiency, can cause immune deficiency. Most other countries do not have a cold and flu season because they do not celebrate with heavy, calorie-filled meals during November, December and January. During these 3 months reported incidences of colds and flus in the USA increase 9 times compared to other months. DAILY DIGEST was launched by Essanté Organics October 2017, just in time to help customers digest those rich, holiday meals. Should you be taking digestive enzymes? It depends on your diet and what you are absorbing from the food you eat. Have you noticed an increase in gut issues among the population? Have you heard people discussing how their bowels are irritated, gassy or bloated? Have you heard parents discussing how adults and even children cannot assimilate nutrients properly? Are you or others you know of suffering with fatigue or low energy? Have you heard the terms reflux, leaky gut, and swollen, upset bowels more than ever before? Do you know people suffering with stools that are too soft or too hard? Do you or others you know eat meat and/or dairy products? Do you or others you know eat processed or cooked foods? If you, or anyone you know, answered “yes” to any of these questions, digestive enzymes can be a highly supportive dietary supplement. We’ve all heard the phrase, “You are what you eat”, yet it may be more accurate to say, “You are what you absorb”. Your body and diet, when filled with ample, healthy digestive enzymes, can support digestion, assimilation, absorption and overall health. Conversely, a body and/or diet with too few digestive enzymes, can result in a cascade of health concerns. Digestive enzymes are tiny proteins required to break down the food you eat into micro and macro nutrients so your body can absorb the nutrition within the food. Digestive enzymes support gut health too. You are not only what you eat, you are what you absorb. If your food is not properly dissolved, digested and absorbed, by they digestive enzymes in your body and food, it can lead to undigested food traveling down into your digestive tract and providing a feast for the “bad” bacteria in your gut. This can cause gas, bloating and swelling. If your undigested food reaches your large intestine it can also negatively impact the balance of good and bad bacteria in your colon. We need digestive enzymes to support complete digestion and in-turn healthy immunity. Optimal digestive enzyme levels are needed to support an overall healthy body. 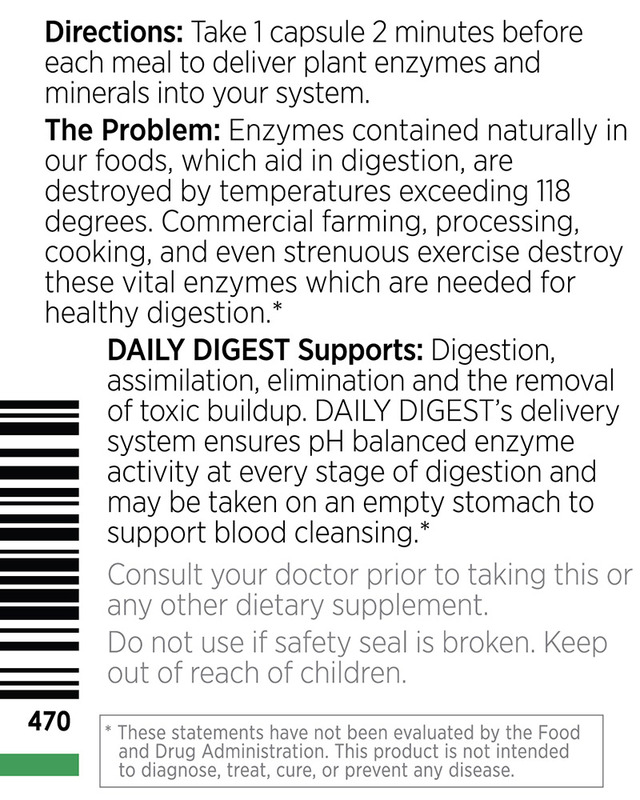 Many people support their health by improving their digestive enzyme levels and this can be done easily with Essanté Organics DAILY DIGEST. A recent study showed digestive enzymes may be more far-reaching than scientists originally thought: one study showed digestive enzyme therapy in children not only supported their gastrointestinal health but also supported healthy mental behaviors. What causes digestive enzyme deficiency? As we age our bodies produce less amylase, lipase and protease, 3 of the key digestive enzymes our body needs to digest carbohydrates, fats and proteins. Drinking water or other fluids while eating a meal dramatically dilutes the digestive enzymes. In-turn this can lead to low and slow digestive enzyme activity, hindering the body's ability to digest and eliminate food properly. If our pancreas, gallbladder, or the brush border of our small intestine are not functioning properly it can lead to our body producing fewer digestive enzymes. If our stomach is not producing enough acid it can lead to digestive enzyme deficiency, because stomach acid is needed to activate digestive enzymes needed to digest the protein we consume. If we are under excessive stress or have poor genetics these factors can lead to digestive enzyme deficiency. Eating meat (animal flesh), dairy products and processed carbohydrate foods can require additional digestive enzyme support, by way of a dietary supplement like Essanté Organics DAILY DIGEST, because humans are not designed to eat meat and dairy products nor processed foods. Humans are the only species that continue to consume milk, after being weened, and from other species. Watch the mind-blowing movie documentary titled, What The Health, to see the validation and benefits of an alkaline diet vs. a meat and/or dairy based diet. In particular, we found the direct links to cancer and heart disease particularly disturbing. What are minerals and are they necessary to activate digestive enzymes? Minerals are the circuit breaker switches of the body. Think about the light bulbs in your house - they cannot be activated without the house's circuit breaker switches being activated first. Like breaker switches are to the many light bulbs in your house, minerals are to thousands of enzymes in your body. Minerals are the body’s electrical transmitters. Minerals, more so than vitamins, are necessary to activate and catalyze enzymatic reactions because most plants manufacture their own vitamins yet they must obtain minerals from the soil (and today many soils are mineral deficient). The mineral tin is required to activate protein synthesizing enzymes. 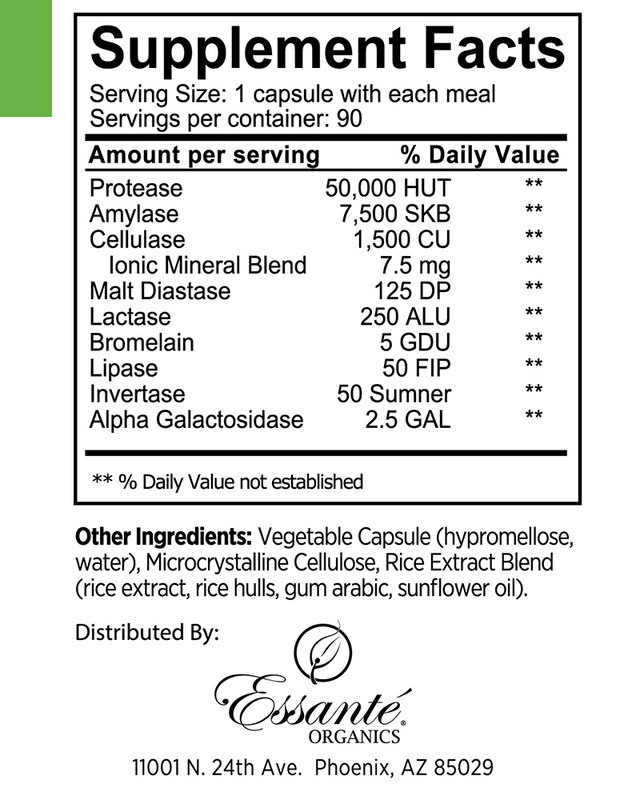 Essanté Organics DAILY DIGEST contains a proprietary cofactor blend of 77 raw ionic minerals by design. For this reason, DAILY DIGEST works superiorly when compared to most other digestive enzyme supplements on the market. A digestive enzyme formula without cofactor ionic minerals cannot and will not work, because digestive enzymes cannot be activated if their specific, respective minerals are missing. Essanté Organics understands the vital role of minerals in the body and how they are required to activate digestive enzymes. DAILY DIGEST is a complete dietary supplement that contains both digestive plant enzymes and cofactor ionic minerals that work together to offer complete digestive support. Unlike DAILY DIGEST, inferior digestive enzyme supplements, those that do not contain all the necessary associated cofactor ionic minerals, are not able to clinically deliver activate digestive enzymes into the body. Was DAILY DIGEST developed and formulated by a Nobel Prize Finalist? Yes. DAILY DIGEST was developed and formulated by Essanté Organics formulation team, which includes Nobel Prize Finalist and renowned immunoenzymologist, Ron, as with all Essanté Organics formulators, his last name is kept private for proprietary and privacy purposes. Ron was hosted by Nelson Mandella in South Africa, where he spoke along side a panel of presidential leaders at a 1999 HIV-AIDS summit to introduce his breakthrough enzymatic and ionic mineral findings and their key role in supporting immunity. In 2001, these achievements gained Ron the title of Nobel Prize Finalist. Following his Nobel Prize nomination, Ron began sharing his enzyme knowledge through numerous international television appearances, including Oprah Winfrey, Good Morning Canada, and Street Talk of Chicago, as well as guest speaking appearances on hundreds of radio shows. Ron has been awarded both domestically and abroad as a leading expert in enzymes and nutrition. In July of 2017 Ron met with one of Cedars-Sinai Medical Center's leading oncologists. To date, Ron continues to meet with global political figureheads, country health ministries, hospitals, and medical universities to provide live nutritional blood profile analyses for and educate both medical professionals and laypersons on his scientifically proven achievements in enzyme therapy and how it supports the digestive system, the immune system, the blood and overall health. In 2017 Essanté Organics invited Ron to their corporate headquarters where in depth discussions began on how to best serve Essanté Organics' customers with a proprietary dietary supplement of the finest digestive plant enzymes and ionic cofactor minerals on earth. With Ron's world-renowned enzymatic expertise and with the addition of Ron into Essanté Organics formulation team, DAILY DIGEST was launched in the fall of 2017, just in time for all those oversized, protein and fat filled Thanksgiving and holiday meals.